13 Guests 1 Member 7 Bots (+21 bot dupes) 1 spammer also just said hi. 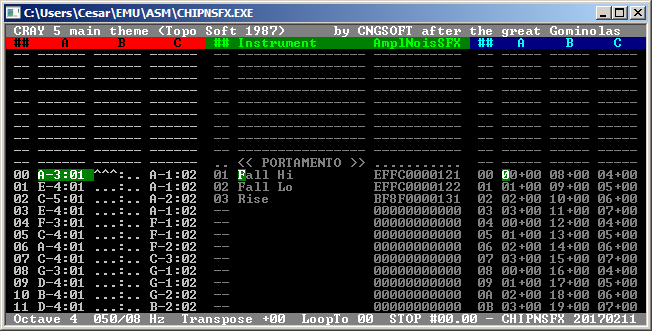 "CHIPNSFX is a musical software suite focused on lightweight code and data (the player itself is under 950 bytes long, and can be as small as 550 bytes) for the Amstrad CPC, Sinclair Spectrum 128 and MSX1 platforms; other hardwares can be supported with minor modifications in the player code, such as Sega Master System. The tracker can create songs up to 256 patterns long, patterns can be up to 96 ticks long, and there can be as many as 255 different instruments. The player itself is hardware-independent, the programmer can provide the external functions required to make it work on any Z80-based platform. " This tools seems quite easy to use. It runs in a windows console. Gave this a quick try but couldn't get it to play or give any audio output - am I missing something? I can't really tell. I've used chipnsfx.exe from Linux, using the "wineconsole" emulator. And I got sound straight from the beginning. Could you enter notes or load a song? If it's mute, maybe some settings in windows are preventing to get audio from the terminal?